This property is only rented once a month. The views are breath taking and the location couldn't be better. It is right across the street from the ocean, Berwick Park and the coastside walking/biking trail. It is a 5 minute walk to quaint downtown Pacific Grove, world renowned Monterey Bay aquarium (2 guess passes are included), historic Cannery Row and Lover's Point Beach. Where you can rent bikes, kayaks, and all kinds of beach toys. Fisherman's Wharf is just a 5 minute walk beyond Cannery Row. There are several golf courses less than 1 mile away. We have brand new beautiful and comfy couches. There is a king size and queen size bed. As well as a futon and roll away bed. We have black out curtains in the bedrooms for your comfort. The decor is modern with a seashore theme. As soon as you enter a feeling of spaciousness and relaxation fills you. The home has all the conveniences, including a laundry room and a fully equipped kitchen. Linens and towels are luxurious. Coffee, teas and condiments are provided for your use. The living area is upstairs and and the bedrooms are downstairs, all rooms have ocean views. There is a real fireplace in the living room, with the TV hung above, wi-fi blu-ray and netflick streaming available. Title floors throughout and black out curtains in the bedrooms. And a full laundry room downstairs. I picked this property for a vacation rental because of the great location and beautiful ocean views. You can walk or uber everywhere you want to go. Even to the movies, banks, grocery stores, shops. post office and hardware store are only a 10 minute walk. Lover point white sand beach is a 5 minute walk. with restaurants and bike rentals. The sea and granite rock beaches are right outside your door. You are as close to Pacific Ocean as you can get in Pacific Grove. Every room in the condo has an ocean view! The sea, the coastside trail and a beautiful green park are right outside your door. You have the living areal/kitchen/full bath on the second floor and the bedrooms and laundry room a second full bathroom are on the 1st floor. The refrigerator has an ice maker and water dispenser in the door. The kitchen is fully equipped with everything you need. Including a crockpot and rice cooker. Coffee maker and blender. 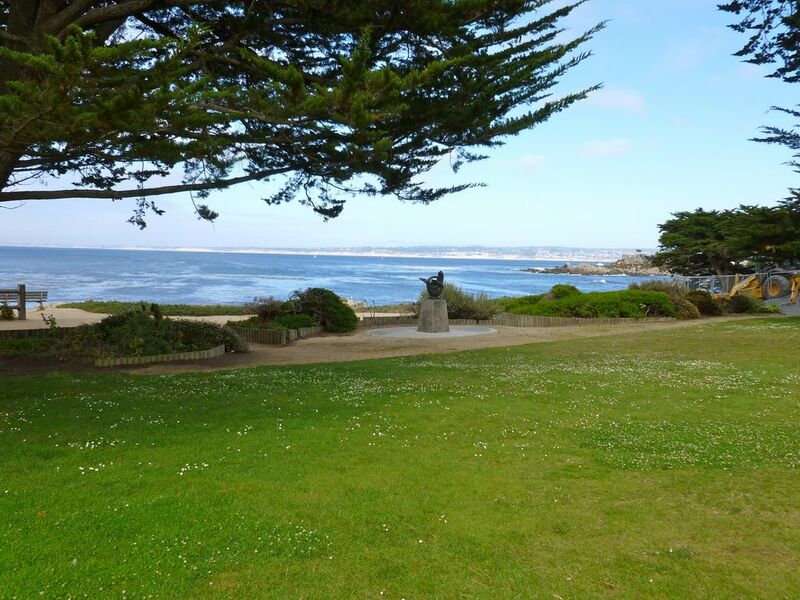 You won't find a restaurant in all of Pacific Grove with a better view for dining! Inserts in the dinning table to lengthened or to make smaller to fit your needs. Beautiful home in the perfect location! On top of the property being great, the owner is very nice, super attentive, and quickly responds to any inquiries. Would love to stay here again in the future. My husband's company rented the Seahorse for a month and I was lucky enough to get to stay there for a few weekends. Great location right across the street from the beach. Clean, quiet and nicely decorated with all the amenities you might need for a comfortable stay. Fully stocked kitchen, comfortable beds and VIEWS that never get old. Bonus to have the aquarium passes as well - Enjoy! Thank you Stephanie, you and your husband were great renters and I hope you return for more good times in PG! Excellent location. Suited us well. Anna was lovely and access to this property was easy. Parking was no problem. The position was perfect....away from busier Monterey (popular at the weekend esp), opposite a park where we played Frisbee in the evenings and where we saw a wedding taking place and also close to the beach where you can rent kayaks and bikes. The kitchen was good and enabled us to cook for ourselves when we didn't want to eat out. We could walk for miles around the coast line and spot all the wildlife but I really recommend taking a kayak out and seeing the otters and seals a little further out. Fantastic. Coming from the UK we really loved the way that drivers are so much calmer and the way that they look out for and stop for pedestrians. On top of that, the Pacific Grove way of life is so relaxed, it was a great end to our holiday. Breathtaking views and very inviting home! Beautiful views, excellent location (close to restaurants, beach, attractions, Carmel). It is a very warm, spacious and inviting home. The owner was extremely helpful and responsive. The property was clean and layout was perfect for our family of four. We would love to return. We enjoyed two months in this comfy, well-equiped condo in a great location overlooking the ocean. Walked every day along the beautiful shore to Monterey or Pacific Grove with it's pretty ice cream colored houses and interesting shops and restaurants. Only one day of rain in two months! Anna was very helpful in every way and I don't hesitate to recommend her lovely condo. We rented Anna's condo almost a month, and we found the unit, location and amenities perfect. We especially loved the amazing views from our condo of the ocean that greeted us every morning. The full kitchen and appliances were very high quality, as well as linens, furniture, and property. We found the location perfect for those in our party who wanted to walk, bike, or spend the day at the Monterey Aquarium. Anna also provided good suggestions on restaurants and shops in the area, to add to our experience. We would definitely recommend her condo to a family looking for a clean, well-maintained home in Pacific Grove, with the best view in town! is just a few miles away. And right in Pacific Grove is a beautiful municipal golf course that has a very reasonable rate.